On the coastal road linking Monastir to Sousse, just a 15 minutes' drive from Sousse & Monastir city centers, only a few minutes' drive from Monastir Airport and 85 km S of Hammamet & 145 km S of Tunis by motorway. • Golf Academy: Qualified & multilingual golf professionals offer individual & group tuition for beginners to advanced players. The magic of the Tunisian hospitality will make you feel home. Only two hours away from most of the major European capitals, you find yourself in Tunisia with its Arabo-Muslim culture, its Carthaginian and roman remains and its wonderful sandy beaches. 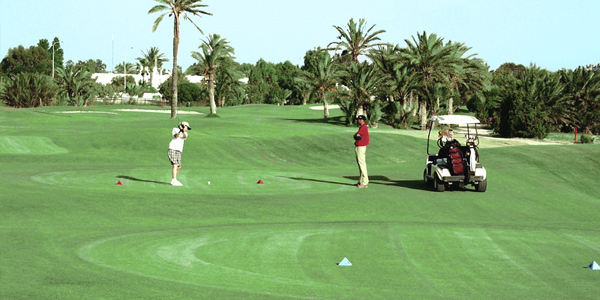 El Kantaoui Golf Course ranks high up among the best courses and is listed among the great international competitions circuits. 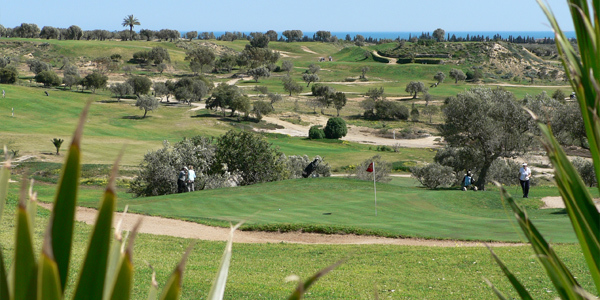 Its playing field covering 130 hectares (321.23 acres), hemmed in by a natural amphitheater of vegetation with the blue Mediterranean as background, offers gorgeous fairways where the greens try to out - do one another in elegance at times framed by centuries old olive trees, or facing the blue of the sea. 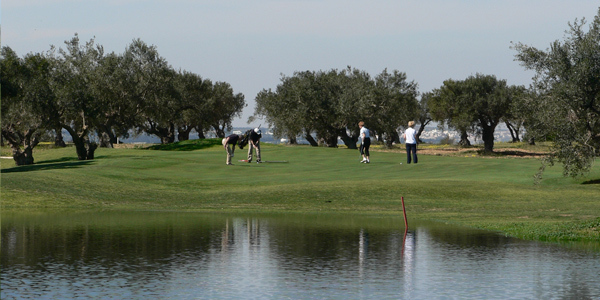 White sand bunkers and artificial lakes add to the beauty of the site and play a part in the obstacles met on the course. The two courses (2 x 18 holes) are open year/round, allowing everyone to play whenever they wish, according to his/her handicap and his/her mood. El Kantaoui Golf Course is hosting all levels of players, from beginners to Tournament Professionals and developing a strong Junior section, also the lessons could be performed in all languages with a very simple and yet effective communication to give you clear ideas and work programs: variety of teaching techniques, from clear explanation, demonstration, to strongly assisted practicing by our PGA pros; highly qualified in helping you to improve your golf. 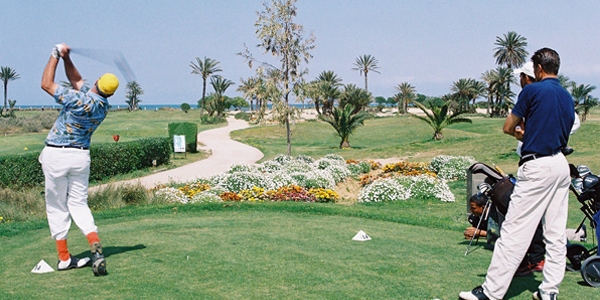 The Flamingo Golf Course (83 ha.) was totally renovated while keeping its original Ronald Fream's design : installation of a new pump station and irrigation system, new shaping and enlarging of Teeing areas, fairways and all greens with addition of new tees, rebuilding of all greens and improving of existing car paths and adding of new ones. 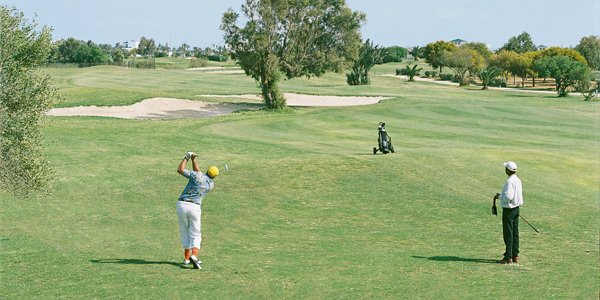 It has a splendid 18 holes championship course, par 72 and several training facilities such as a wide driving range, pitching and putting greens around the club house which offer a pleasant game to both amateurs and professionalisms. Its panoramic terrace overlooking the entire course is the perfect place for our guests to savor delicious Mediterranean cuisine after an enjoyable golf party. A well stocked Pro-shop and many other commodities(hiring equipment, caddies,..) are offering a complete service and a pleasant stay to the welcome guests' Flamingo Golf Course. The Academy aims is to help its clients to get the most out of their games ; not by changing and improving a whole new techniques or way of playing , but by concentrating on a little small things that will help to improve their games , and with a few shots off their score. Thanks to the serious of their pros, personalized programs and state of the art of communication and practice facilities, clients will be able to enjoy all their challenging holes. The academy provides a series of programs elaborated to suit every golf-level , from the scratch player to the first beginner . • Individually watching and training programs. • Groups and corporate golf clinics. Open every day from 7am to 6pm in winter and from 7am to 7pm in summer. Club House with lounge, restaurant and bar, lockers. Transfers by shuttles (paying) from hotel to golf course (and return) are available.